Concentrated cannabis products such as oils, waxes, liquids, edibles, and pills are becoming more common, due to the fact that most patients would prefer not to smoke flower. Sometimes these concentrates require solvents to help extract the medicinal cannabinoids and aromatic terpenoids from the cannabis plant. 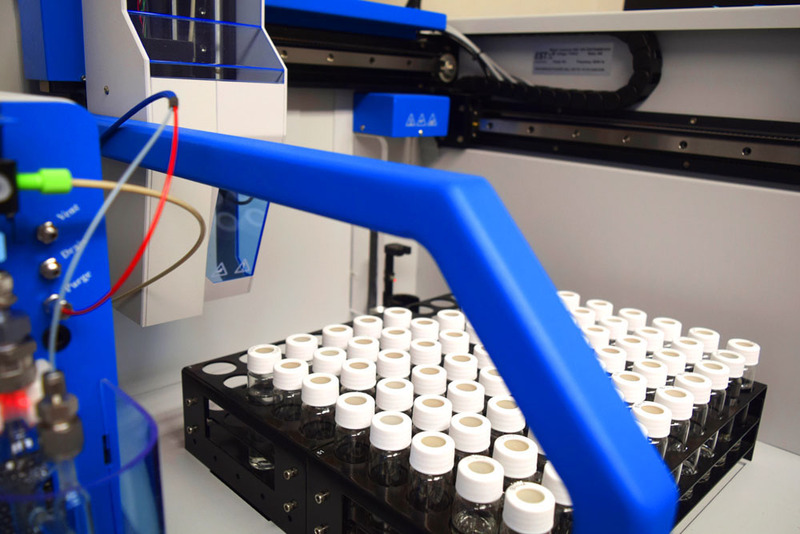 Cannabis residual solvent analysis from an independent medical marijuana testing lab like MCS ensures that your product meets quality specifications and safety standards. High-quality concentrates offer consumers abundant levels of cannabinoids in smaller doses. Potent extracts with higher concentrations of terpenoids provide maximal effect, with a superior flavor. To create these concentrated extracts, producers will sometimes use hydrocarbon gases like butane and propane, as well as common solvents like ethanol, isopropanol, and hexane to bring out the essential oils. After post-extraction processes like winterization, vacuum and heat, residual solvents remain behind. These ingredients can be ingested or inhaled by users in appreciable quantities. Even if you are doing a solvent-less extraction with dry sieve, carbon dioxide, or water, solvents are often used in cleaning the equipment and can end up in the final product regardless. That is why testing is crucial for patient safety. Testing can also give producers a clue as to the purity of their source materials. Class 1 – Volatile solvents to avoid – including known and suspected carcinogens and environmental hazards. Class 2 – Suspect solvents to limit – including animal carcinogens, teratogens or reversible neurotoxins. 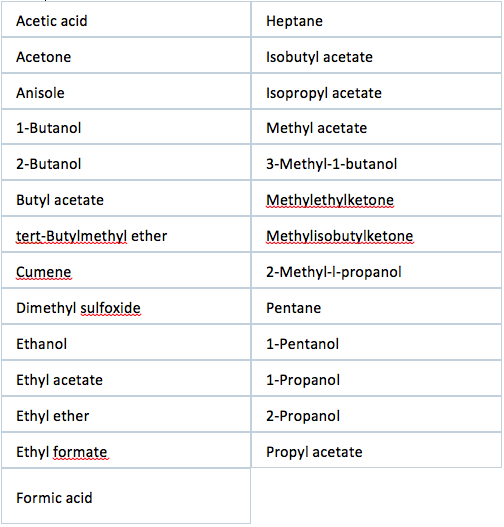 Class 3 – Safe solvents to use – including low toxic potential chemicals. The presence of solvents like pentane and isopentane can indicate that the butane or propane used for extraction were of poor quality. 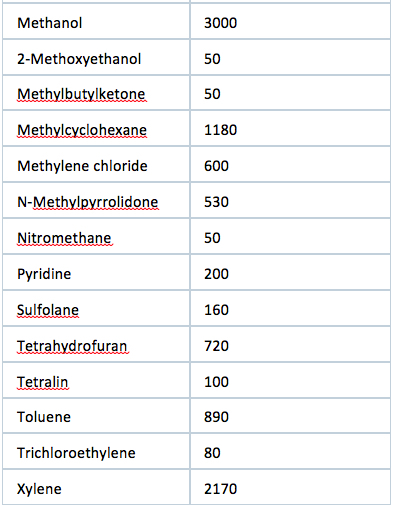 Similarly, food grade ethanol obtained by permit is safe to consume, but chemical grade ethanol produces residual solvents like methanol and isopropanol at levels of 4-10%. Hexane is the only Class 2 solvent routinely found in cannabis extraction solvents. Hexane is a petroleum distillate that has been linked to respiratory irritation, dermatitis, liver and kidney failure, and Parkinson’s Disease. Hexane levels should be as low as possible to avoid unwanted side effects. In rare cases, we have found naphtha, a petroleum distillate found in paint thinner and kerosene. This extraction solvent can include contaminates like benzene and xylenes – Class 1 solvents and known carcinogens. While it may be more cost-effective, the potential health effects are cause for concern. 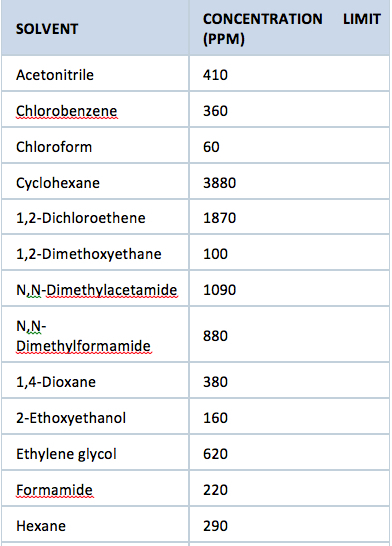 What Levels of Residual Solvents Are Safe? Why our residual solvent testing? MCS offers cannabis residual solvent testing to make sure your products — such as wax, liquids, oils, pills and edibles — are safe for consumer consumption. With our residual solvent testing, you can be sure that your cannabis concentrates are free of all impurities. We use industry-leading technology such as gas chromatography flame ionization detector, GC-FID/ head space analysis to monitor the ppm levels of solvents and identify harmful contamination levels in raw materials. 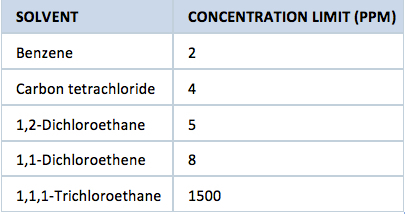 Our data suggests that proper purging and product control can virtually eliminate residual solvents from concentrates. As lawmakers grapple with new safety standards and rules, it’s best to be ahead of the curve on this issue by establishing safe extraction techniques, quality control processes, and pure sources. Contact us today to learn more about our residual solvent testing service and all of our cannabis testing services.